With chalky cliffs, pristine sand and aqua water, Tropea’s beach has been named of the ten best in Italy. Off the beach, Tropea is the consummate old-time Italian resort. The daughter of guidebook king Arthur Frommer, Pauline Frommer, has launched her own guidebook series. 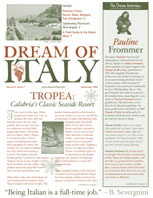 including Pauline Frommer’s Italy. Pauline Frommer tells us where to eat, shop and stay in Rome, Milan, Bologna, Deruta and San Gimignano.